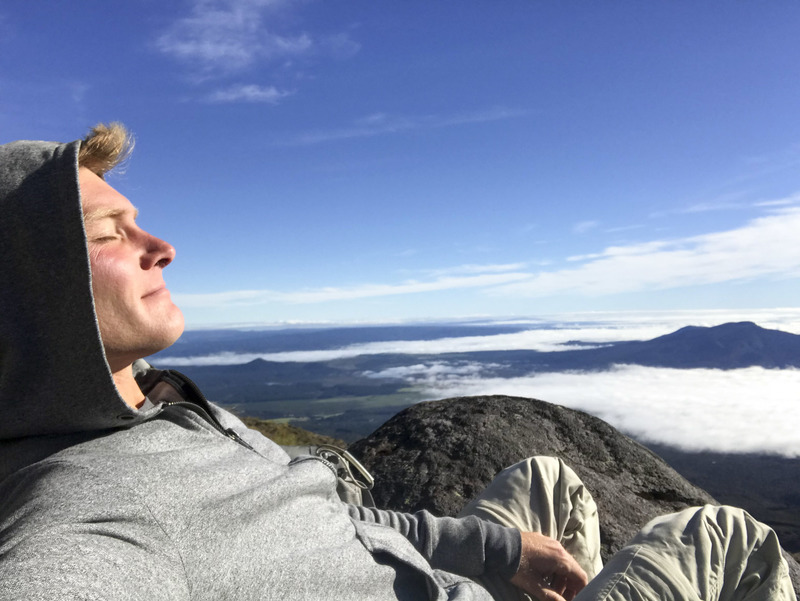 My arrival in New Zealand came after several months of intensely rewarding but still mentally taxing travel. 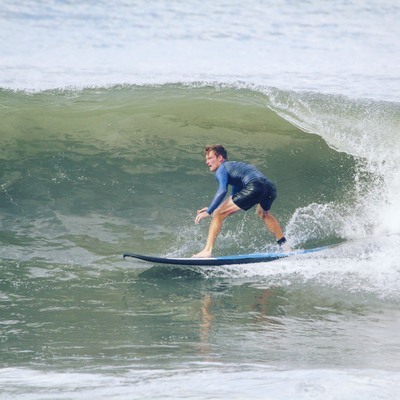 Like a kid on a sugar binge, I found myself full to the brim of epic scenery and life-affirming experiences to the point where any more seemed simple gluttony. Like any good sugar addict, the solution here was to pile on something even sweeter. 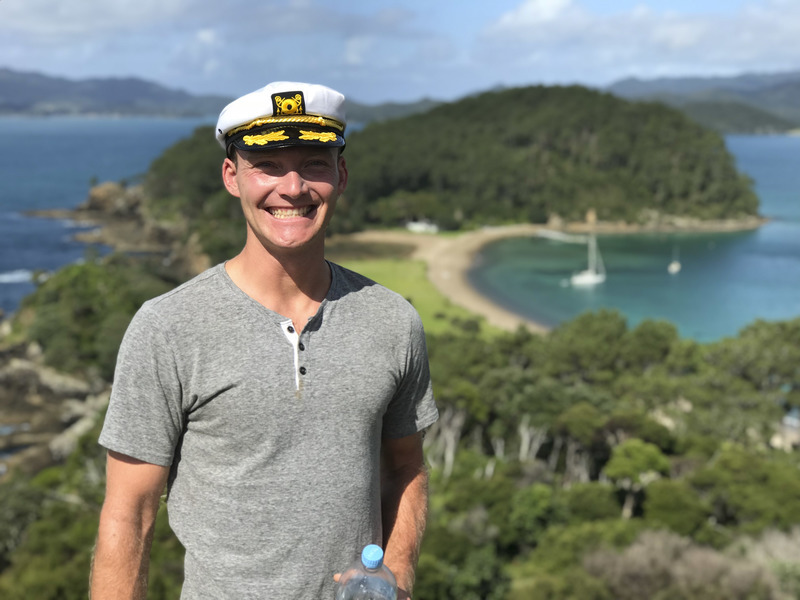 At the wheel of my first rental car of the trip, I set off northward from Auckland to catch a date with a sailboat in the Bay of Islands. 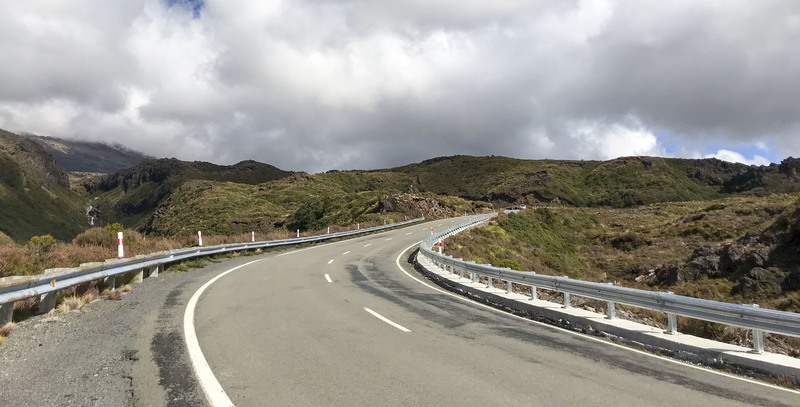 While I'd spent months riding on the "wrong" side of the road, it wasn't until I had to drive an actual car that I truly felt the strangeness of it. You can get used to having the extra bulk of the passenger's seat on the left instead of the right but I never quite acclimated to the switching of the turn signals and windshield wipers. 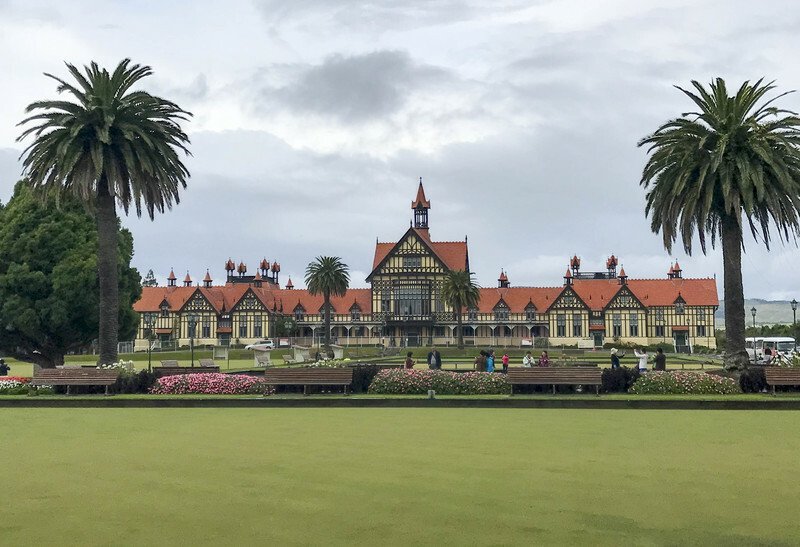 Though I would have preferred a motorcycle (or camper van), it didn't make sense given the rest of the North Island itinerary and, with wet weather in the forecast, I was actually looking forward to having some creature comforts on the road for once. 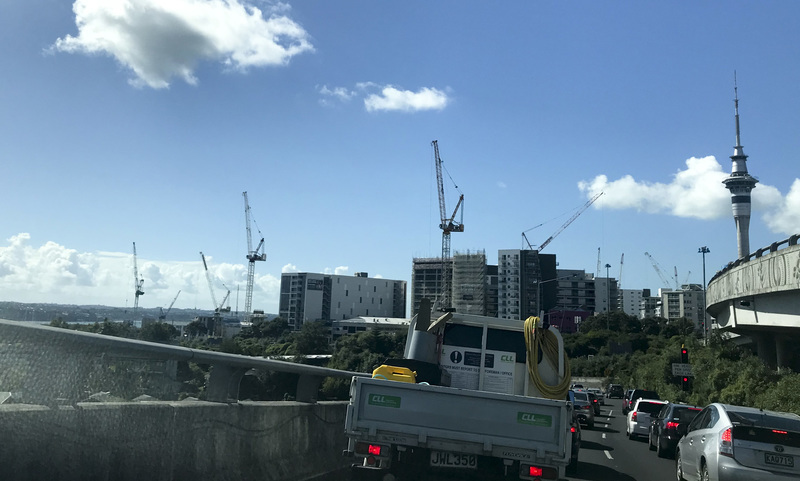 Auckland felt like a very small city tucked against the sea but construction cranes rose above the buildings like a menagerie of mechanical giraffes and I got the sense that its skyline would look drastically different in just a few short years. But I wasn't here to spend time in the cities and continued north through the afternoon. 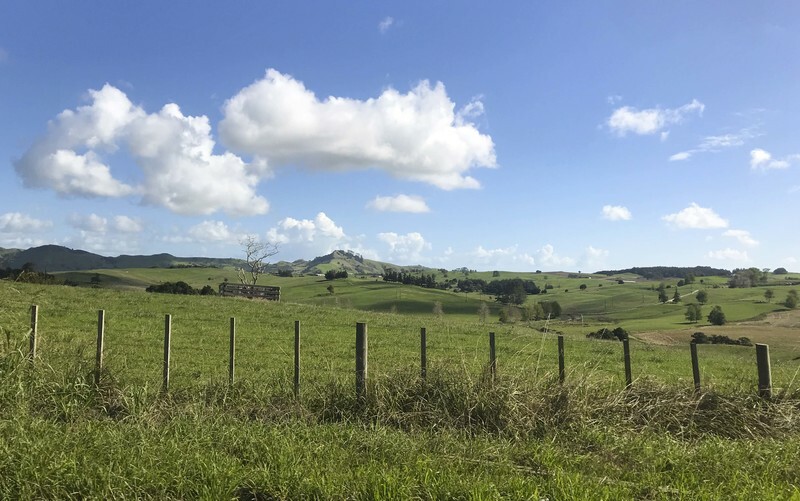 As I left the city traffic, the road quickly began tracing through rolling green hills dotted with trees and small herds of fluffy white sheep. I couldn't help but keep shaking my head, asking myself "is this for real?" as a dreamland of pastoral splendor rolled slowly past the windows. 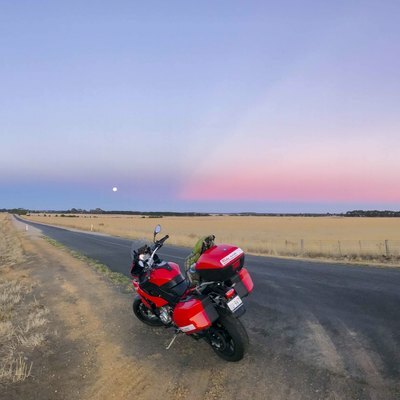 Whereas Australia had been yellow and dry in the late summer heat, this countryside was vibrantly green and the thick tall grass was still wet from the latest rainfall. Every few hours, I was doused by another rainstorm but they tended to move on quickly and resolve to fragile rainbows. And still the countryside revealed more hills, fields and pastures as I continued into late afternoon. I took the ferry up to the Russell marina and met Doug, an entrepreneur with a very successful travel backpack business, and Abrye, a friend of his who had spent the summer afloat as training for future ventures into maritime hospitality. 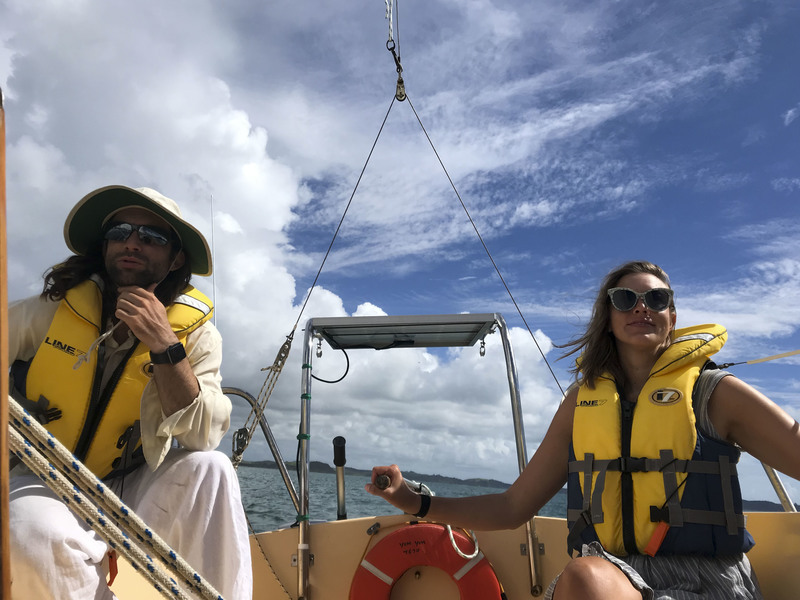 They lived on Doug's small sailboat, using 3G to access Internet as necessary and otherwise enjoying the freedoms of life on the sea. I hadn't been on a multi-day sailing trip since my ill-fated venture years earlier in Greece, when I accomplished a life goal to sail the Saronic Islands but became deathly ill due to an unrelated mold infection and ended up missing some of the key highlights of the trip. 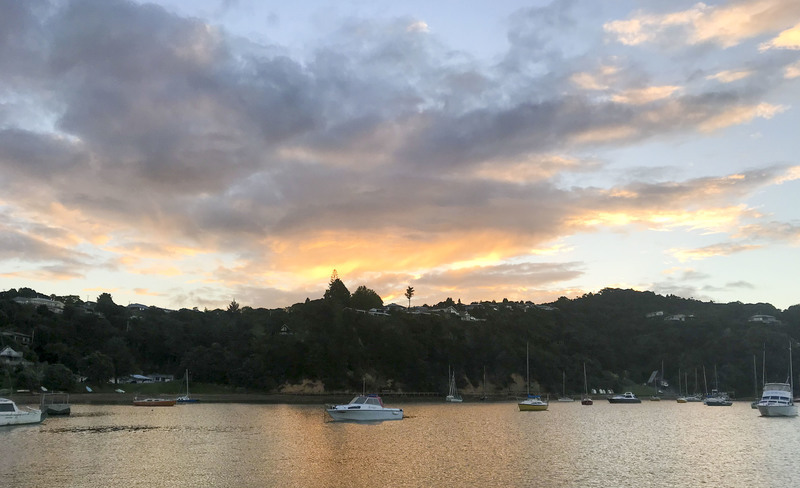 In this case, we decided to set out into the morning light and explore some of the highlights of the Bay of Islands. The day began somewhere between cool and warm but the wind was up so we were able to put up the sails and venture into the rolling waves of the bay. Breaking free from the large rollers of the unsheltered bay, we cut over to Cook's Cove, the landing place of Captain Cook's Endeavor in 1769. 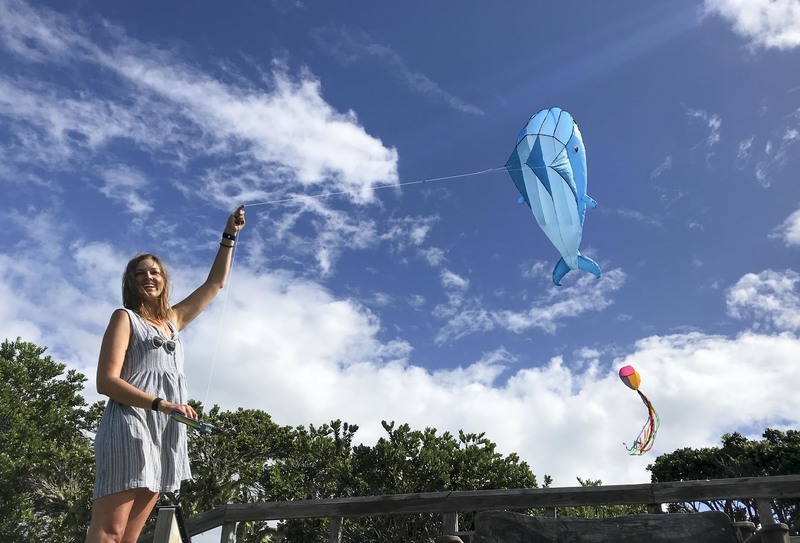 The island, called Motuarohia, is typically a top tourist attraction but we found ourselves generally left to our own devices. Perhaps it was the mid-week timing, the lateness of the season or the rain that threatened. In any case, after anchoring, we were able to hike to the top of the lookout and enjoy the sunshine relatively undisturbed. 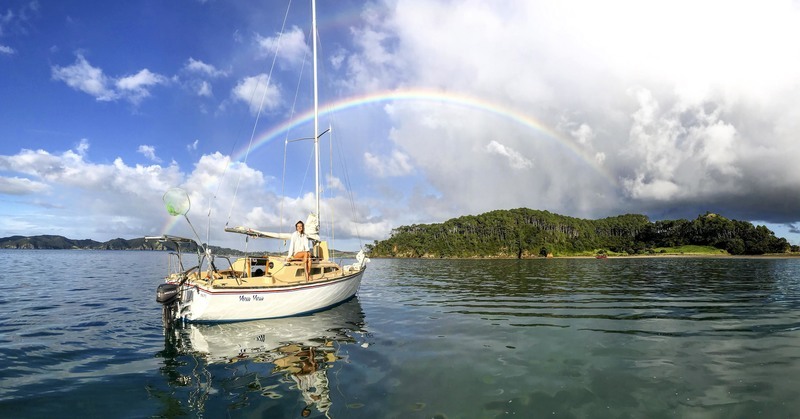 After a peaceful night spent in good company as the only boat anchored in this incredible bay, we dove in for a morning swim that was crowned by a spectacular rainbow, courtesy of the storms that still skittered along the horizon. After a breakfast that again proved Abrye's talents with the small cooking setup, we set off back to the marina under blue skies and parted with a sincerity unusual for having spent just a couple of nights together. The closeness of the space and the teamwork to get there no doubt helped. The long ride down south to Matamata was marked by the same storm chasing as the way up had been, giving me a full appreciation for the origins of such lush foliage. 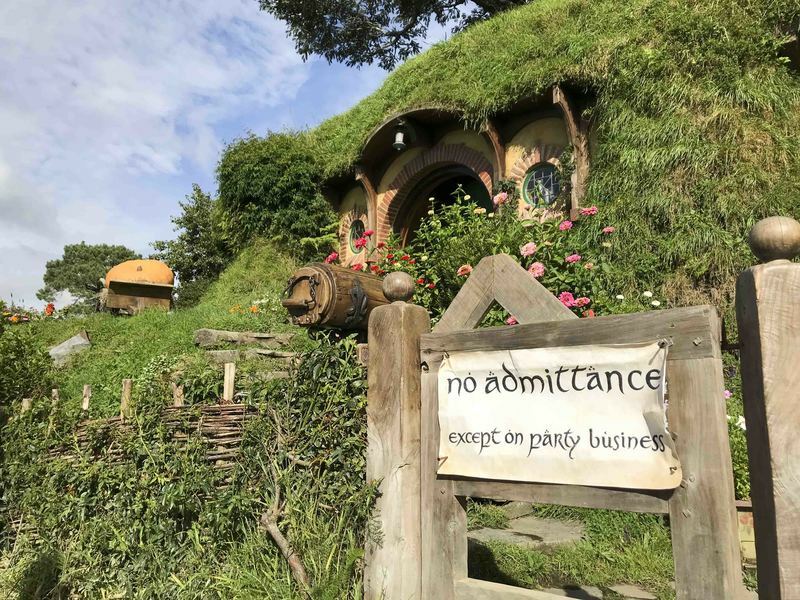 Matamata isn't the kind of town that would typically make you stop - it has roughly the same setup as any small town in Australia or the US - but it is the gateway to Hobbiton, the film set for The Shire in the Lord of the Rings and Hobbit movies. The movie set has an interesting history. As part of the original agreement for the first LOTR movies, the set on the Alexander Farm was dismantled completely. 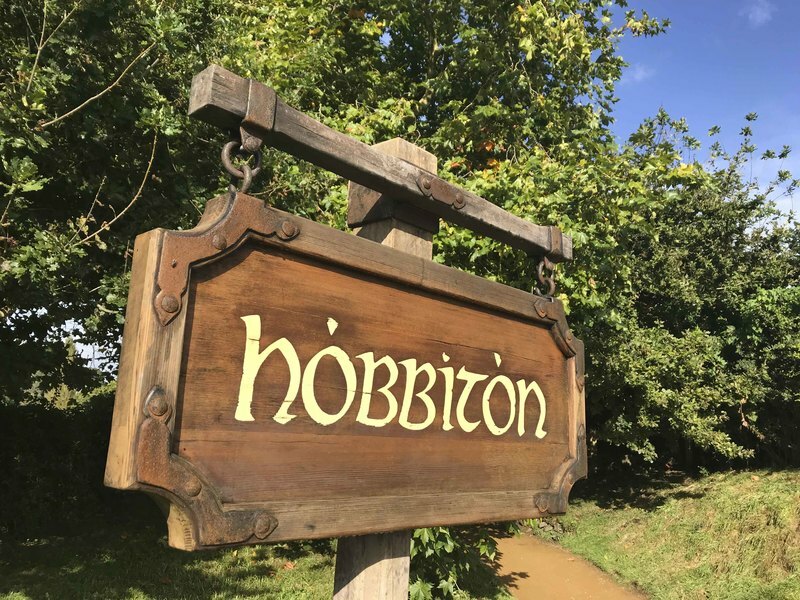 When interest in the films had clearly reached a fever pitch and filming began for the new Hobbit series, requiring them to recreate an identical set as before, both sides agreed to make this one a permanent fixture and a tourist location. Even to those who aren't LOTR geeks, the set is stunning. 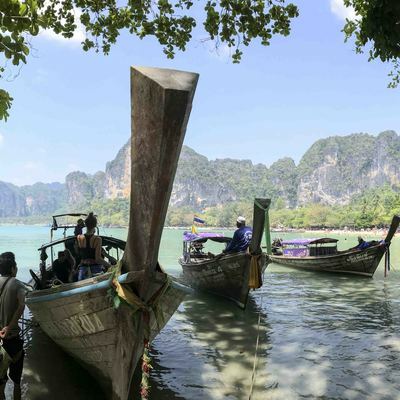 The attention to detail is considerable and you feel like you really are stepping into the idyllic paradise depicted in the films. 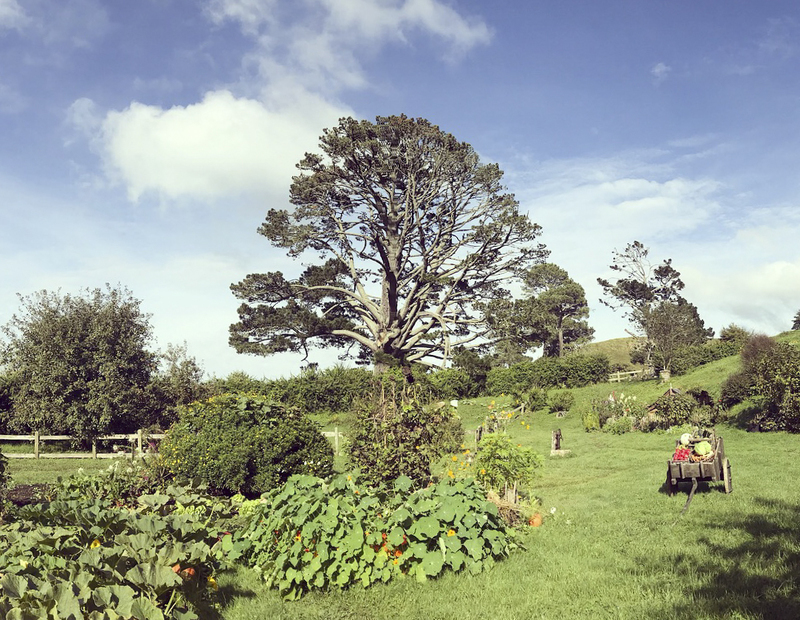 The set, which sees 600,000 visitors per year, employs a half-dozen full-time gardeners and caretakers to keep the real gardens, orchards and pumpkin patches abundant and lush. As one of the earliest groups of the day, we were able to run amok a bit before the masses of following groups piled in behind. I simply couldn't get over how idyllic the set was, down to the real fruits in baskets by the side of the road. 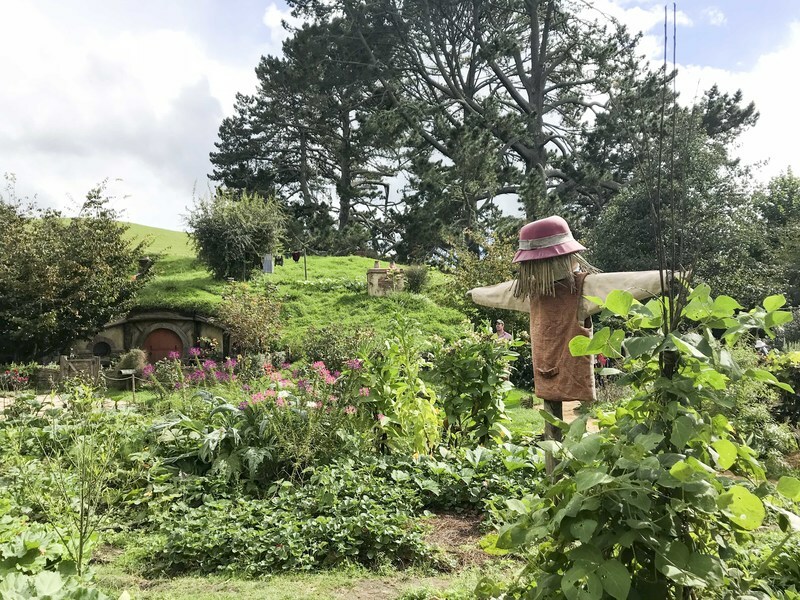 The only fake piece of scenery, other than the obviously-not-real hobbit holes, is the tree over Bilbo's house, which had been a massive oak during the LOTR series. 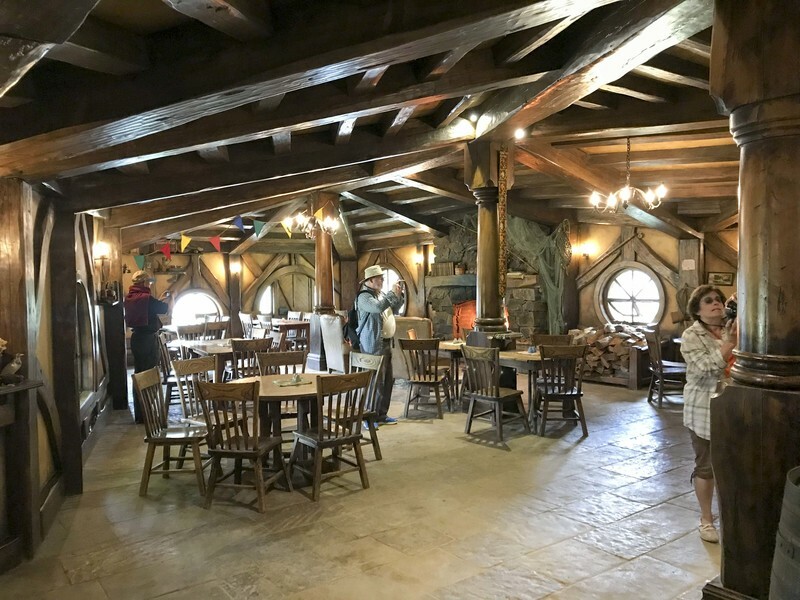 When that fell down and they had to recreate it but 60 years younger for the earlier Hobbit timeline, they painstakingly hand-crafted each leaf and bough out of composite materials. It is so realistic that apparently only the birds aren't fooled... they refuse to nest in it. 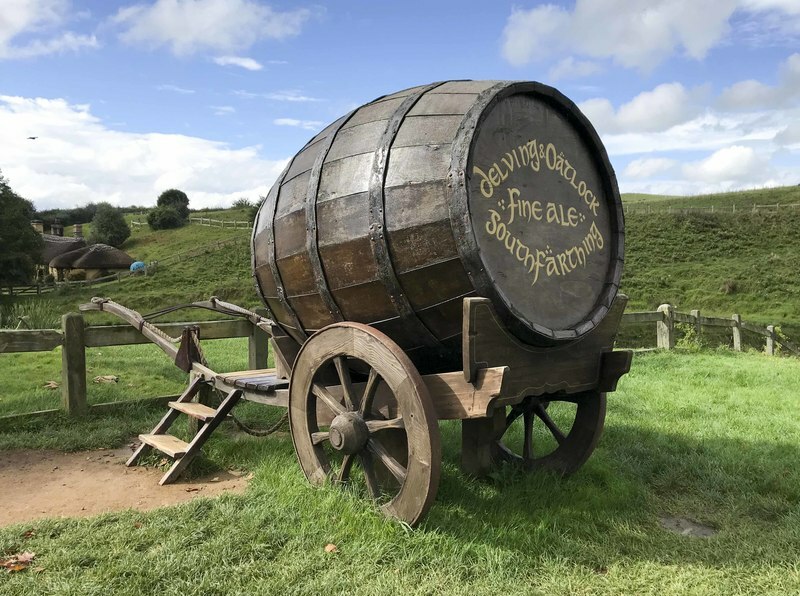 The tour even completed with a real pint of ale in the Green Dragon Inn (which was in its third iteration after having been burned down deliberately during filming twice already). Nerd sense well satisfied, I left the set for Rotorua, keen to explore some of the volcanic features of the island that rose close to the surface in the area there. 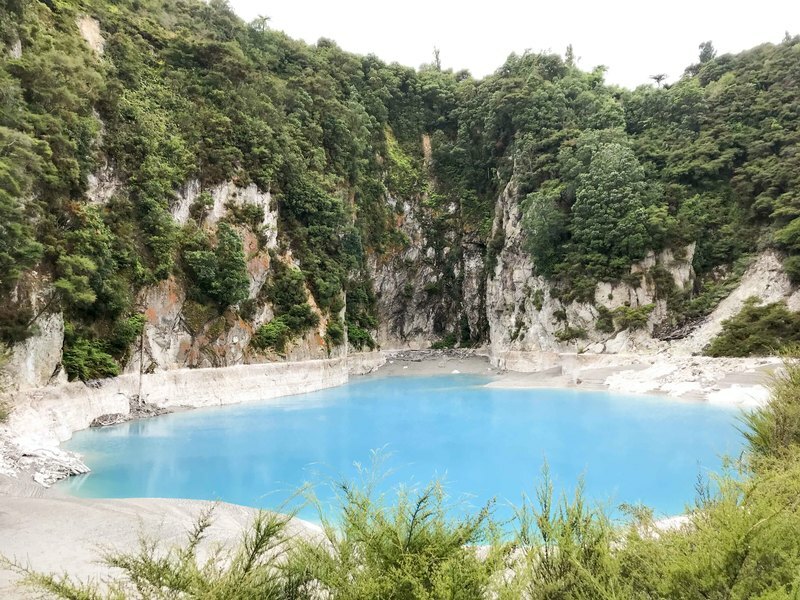 My first stop was one of the few disappointments I had -- an entrance fee of ~$35 for a 2 hour walk along steaming hot pots and a boiling river which were certainly interesting but hardly worth the price. The town of Rotorua, where I spent the night, is situated on a large lake of the same name and is draped in the sulfurous smell of volcanic activity. The historical buildings were surprisingly formal. Continuing to follow in the pathway of the Lord of the Rings movies, I ventured further south towards the peaks at the center of the island. Along the way, I stopped for a photo and realized that I'd caught the interest of a local mare. As the road wound higher, the already cool early-autumn air became even chillier and the landscape changed from the pastures of the valleys below to a heartier and more volcanic sort. 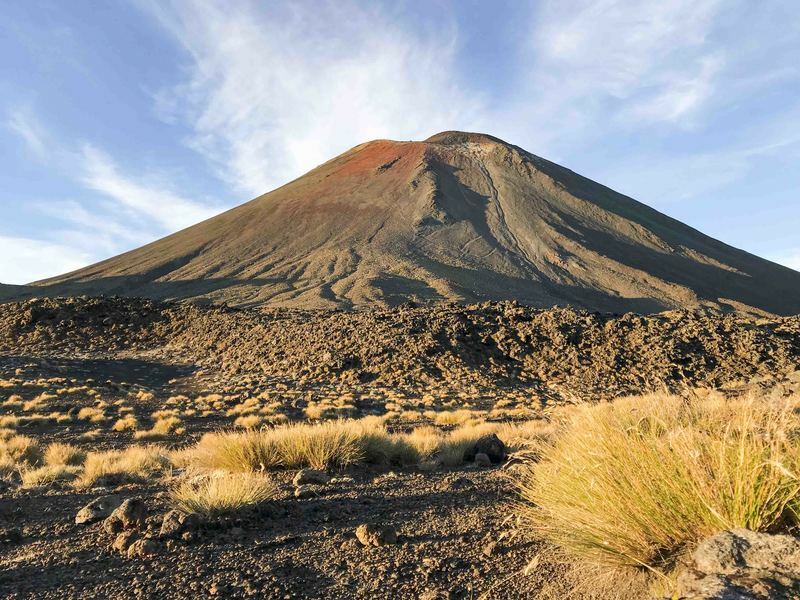 The wind picked up and the air crisped, whipping the sparse grasses that tufted the tops of char-dark rocks on the edge of Tongariro National Park. 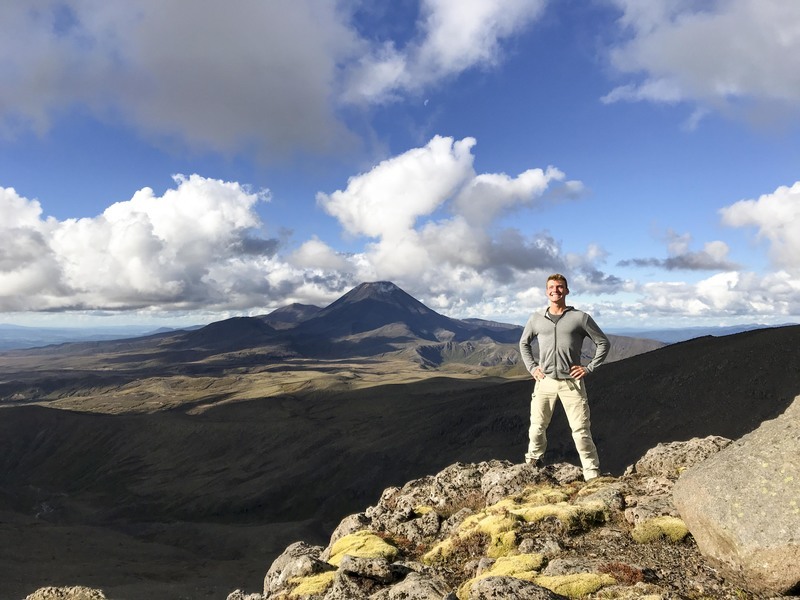 The 19.4km Tongariro Crossing hike is one of the most popular in all of New Zealand (and consistently rated a top 10 in the world) because it takes you across a wide range of volcanic landscapes at the very ceiling of the island. Waking well before dawn, we piled into a van and bumped our way along the dirt road to the starting point. With the barest hint of light on the horizon, bundled up against the cold wind, I set off along the quiet trail, leaning into the small circle of light cast by the head lamp. The track started flat but gradually rose upwards. As the light grew, the jagged shapes to either side resolved into mountains of sharp volcanic rocks. Too young or too harsh to grow much vegetation, the landscape bore a gentle tinge of sulfur along the wind that whistled up the canyons. Dawn came as I crested the first saddle, bathing the mountainsides in gentle light. 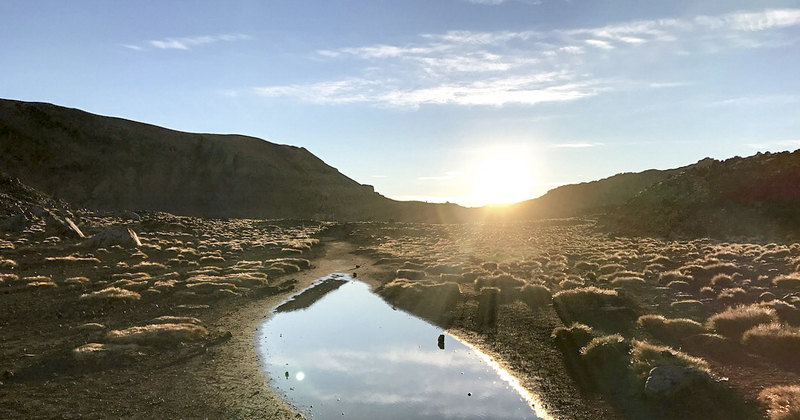 Crossing a basin filled with packed sand and tough shrubgrass, I closed my eyes and walked towards the sun that had just crested the far rim. The early light set the landscape afire. To the right, Mount Ngauruhoe stood sentinel over the basin. Cresting the far side of the rim, eyes driven to tears by the wind beheld a darkened ravine below that extended downwards into the clouds that separated it from the lower valleys below. It was utterly desolate and incredibly peaceful so far above the clouds as the dawn continued to march onwards. 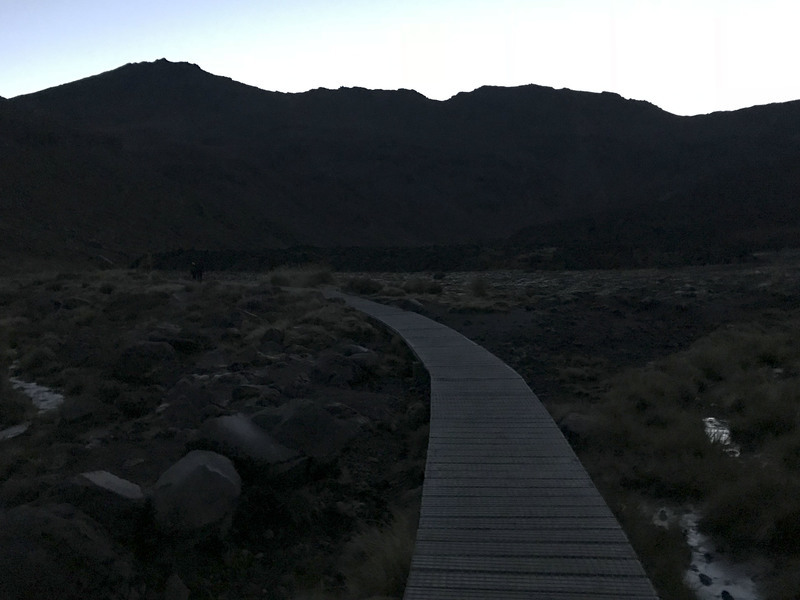 The trail carried down to a series of volcanic lakes colored that particular milky green that you only seem to find in such savage places. I'm undeniably drawn to high places with epic views so it wasn't hard to find excuses to soak up the morning at the heights of Tongariro. The journey down the far side wound down from the desolate peaks and through a landscape where every vertical drop saw another new plant species just able to scrabble out an existence. Lichens and scrub grasses became wiry bushes which eventually fought for space with hearty mosses and even flowers. Eventually the path descended into a dense forest where signs warned of which areas carried the highest risk of death should a volcanic eruption trigger a lava flow or rock slide. Finally arriving at the parking lot, tired but not exhausted, I caught the shuttle back to my car and continued my journey through the heart of the North Island. The western side of the island was, if anything, even more perfectly pastoral than the north or east had been. 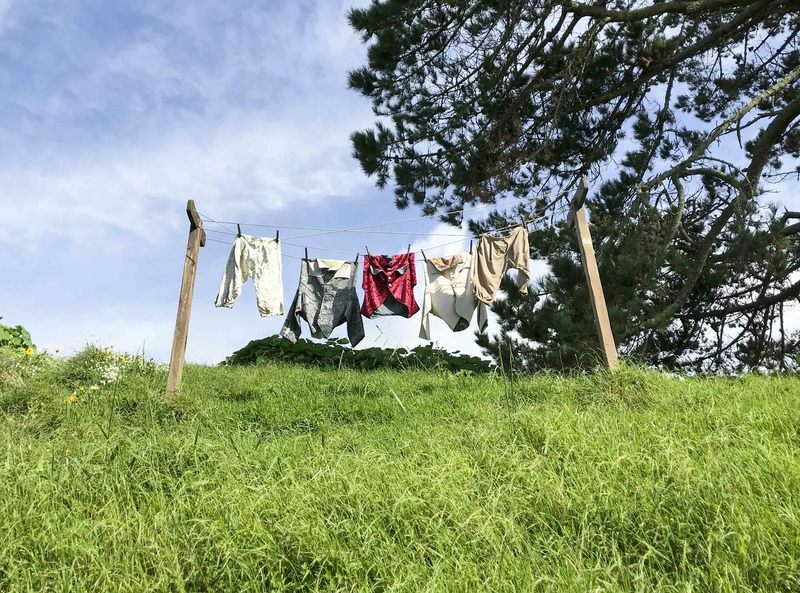 It became almost a task to pull my attention back to the moment and appreciate the absolute perfection of rolling hills descending through verdant valleys, dotted with perfect little sheep reflected as puffy white clouds in the sky and cut with railroad tracks receding in to the distance. 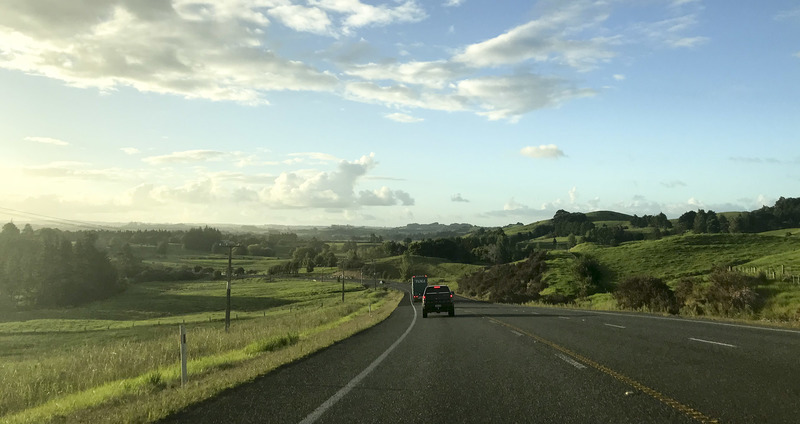 My final days on the North Island carried me back up to Auckland, winding along more farmland where I could stop off and get fresh-picked blueberries or drop into a town for a locally brewed craft beer at will. A night spent in Hamilton was relatively forgettable but otherwise I constantly had to pinch myself to stay focused on what was around me. 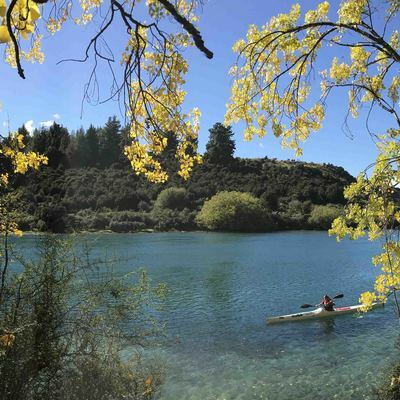 They say that most travelers should skip the North Island and go straight to the South Island instead. I can't argue too hard against that, knowing now what was to come ahead, but nor can I deny how much beauty the North Island had to offer. 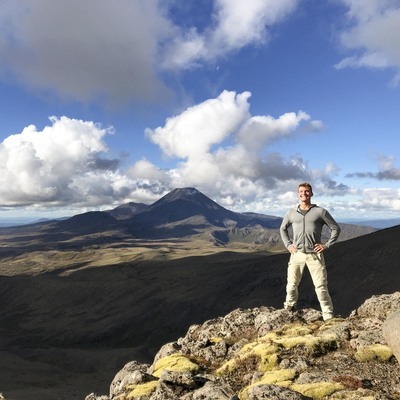 The spread of experiences -- from sailing a small boat to driving through endless farmland in a car to crossing the Tongariro on foot -- makes it difficult to pull together a coherent summary narrative. 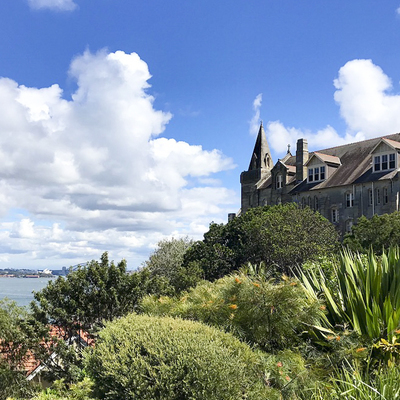 Needless to say, I loved the time I spent and, as I came full circle back to the Auckland airport, I couldn't wait to take on the South Island in all its glory to finally close out this grand adventure.